Mitchell's New National Map of the United States, North American British Provinces, Sandwich Islands, Mexico and Central America together with Cuba and other West India Islands. This is the first edition of Mitchell's important 1856 wall map of the United States, Mexico and the West Indies. Depictss the entire nation from Atlantic to Pacific with inset maps of the World on Mercator's Projection and the World on Globular Projection, and Hawaii (The Sandwich Islands). In his important book on Mapping the Transmississippi West 1540-1861 , Wheat calls this map an 'achievement' and describes it's western portion in considerable detail. 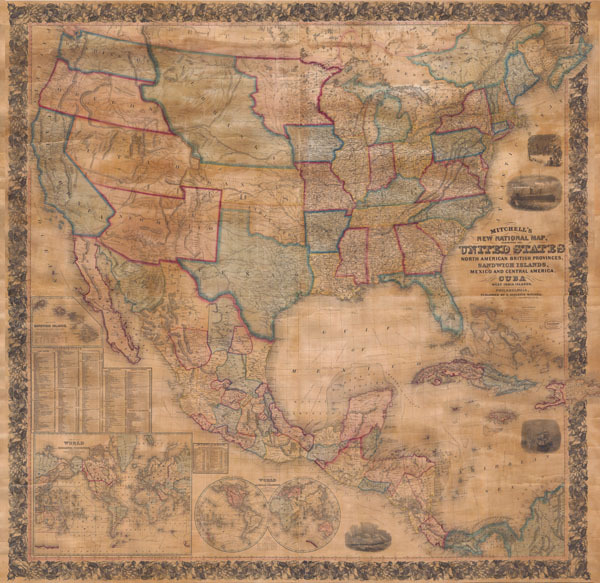 This wall map includes the territory acquired following the Mexican American war and was one of the best depictions of the Western U.S. to appear in the 1850s. The map includes the 1854 Gadsden Purchase in Texas, the 1855 Mexico / United States border, and detailed information derived from Stansburys 1852 study of the region. A seminal map and a must for any serious United States, Southwest or Trans-Mississippi map collection. Expertly repaired, backed with modern linen, trimmed in maroon cloth, on original wooden rollers. Wheat, Carl Irving, Mapping the Transmississippi West, 1540-1861 (5 vols), page 731.